Jack Kulp, President and founder of TrafFix The old saw, “necessity is the mother of invention,” holds particularly true in the entrepreneurial world, as Jack Kulp, 71, President and Founder of TrafFix Devices Inc. (www.traffixdevices.com), will attest. TrafFix Devices - since April 1 in its new building next to Metagenics on Avenida La Pata in Talega - has 225 employees worldwide, 50 in San Clemente, owns other plants in Fairfield, Iowa, Adelanto, CA, and Tijuana, Mexico, makes nearly 100 products and does almost $20 million in annual sales. It has become one of the nation’s largest one-stop shops for everything in signs and stands, barricades, cones, crash attenuators, and channelizer drums for road safety and traffic control. However, it might not have even existed if Jack Kulp had not lost his job in 1987. In that year, after he had managed the traffic signal division of mega-billion-dollar conglomerate Lear-Siegler Inc. for 13 years, financial woes forced LSI to sell the division to raise needed cash. Jack offered $9 million in leveraged funds and a competitor offered $9 million in hard cash, so Jack was out of a job. Jack’s firm leads the industry in innovation. Jack states, “Competitors generally follow our leads as with the ‘grabber cones’ (http://tinyurl.com/5dxoqu).” These channelizer marker cones have easily-grasped narrow, flexible tops which allow a worker in a moving vehicle to pick them easily off a street after, say, a striping job completes. For firmly anchoring its cones and barrels, TrafFix makes its own bases, from recycled rubber tires, at a wholly-owned crumb rubber (http://tinyurl.com/6oy95l) plant in Adelanto, CA, which processes over 100,000 pounds of crumb rubber weekly for sale worldwide. TrafFix Devices is also the leader in selling Impact Attenuators (http://tinyurl.com/494rpn). TafFix Devices new building on Avenida Pico in San Clemente. These devices absorb collision impact and thereby reduce damage and injuries on highway jobs. Say a driver falls asleep on the freeway and runs off the road at high speed... these devices, (often truck or trailer-mounted) (http://tinyurl.com/5usygz), or material-filled barrels (http://tinyurl.com/632ky2), shield work crews and protect motorists who otherwise would have crashed into the unyielding back of a construction vehicle or worse. TrafFix’s biggest customers are the traffic barricade and light rental firms —- independent businesses that rent traffic control and safety equipment to contracting firms who work on roads and highways. 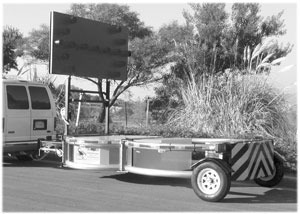 Before a device legally goes on a Federal highway, it has to be proven to meet National Cooperative Highway Research Project standards. “Everything that we make today meets these NCHRP 350 standards,” says Jack. Over the years, the firm outgrew the five buildings that it had occupied in Rancho San Clemente Business Park and Jack says it’s immensely more efficient to be in this single new building—-one that Jack, who has a Mechanical Engineering degree from Cal Poly Pomona, worked upon designing from April 2003 to April 2008. 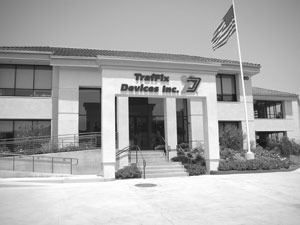 TrafFix Devices, Inc. is located on Avenida Pico and can be reached at 949-361-5663, www.traffixdevices.com or Info@traffixdevices.com .